Details: 2 Bedroom, 2.5 Bathroom, 1,325+/- sq. 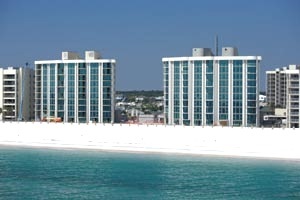 ft.
Info: Perdido Key Condo For Sale at Perdido Towers. This 2BR / 2.5 BA tastefully decorated residence features an incredible two story wall of windows allowing natural lighting to flow thru both levels of this unique floor-plan. Upgrades include New HVAC system replaced within last 18 months and Carrier Thermostat with WI-fi app for convenience, 3 TV’s and all mattresses are less than 1 year old. Perdido Towers owners and guests enjoy tons of amenities including Gulf-front pool, tennis courts, fitness room, picnic area and owner lounge. Details: 2 Bedroom, 2 Bathroom, 1,050+/- sq. ft.
Info: Perdido Key Condo For Sale at The Mariner. 2/2 property with incredible views of the Gulf, beach, pool & well manicured grounds at The Mariner. This condo is the perfect retreat – hardwood floors throughout the main living area, stainless steel appliances, and beautifully finished bathrooms with tile showers. The Mariner offers a beautiful beach with a large footprint, excellent boating facilities with access to Ole River, as well as a beautiful pool surrounded by a stunning landscaped courtyard. This entry was posted in Florida Panhandle and tagged Activities, beach, florida, real estate, Things To Do. Bookmark the permalink.